If you’re young and live in a city, you probably know people who say they “DJ” or “spin.” These days, that tends to involve plugging a laptop into some sort of sound system. To many of us out there dancing to whatever the person in the booth is spinning (or just enjoying or mocking the song choices), the question of how to stitch songs together into a one long, danceable groove remains one of life’s great party mysteries. How they get the beats and even some of the notes to line-up, so that one song fades into the next? It’s actually really easy these days, because computers are smarter than record players. This summer, you might find yourself hosting at least one banger, and could be invited to many more. If you’d like to try your hand at spinning some tracks, even in low-pressure situations like a small house party, take advantage of the following demystification of DJing with a laptop or an iOS or Android smartphone or tablet. All of the following programs are free — and so easy that the hardest part is choosing the tunes. Best of all, if you’re just trying to keep the party going and don’t necessarily want to spend the whole night behind the decks, most of them have an Automatic mode that keeps the cross-fades smooth as you freshen your beverage and mingle with friends. First, we’ll cover the apps, then what you can do with them. The free cousin of the paid Virtual DJ Pro, this computer app is the best (that we have found so far), most beginner-friendly DJ software that is available for free. Virtual DJ Home something of a standard, with an intuitive interface and features ranging from inserting pre-recorded samples to a ‘broadcast’ function that allows users to stream their sets over the web in real time. Are you not the type to throw a party? Well now you can invite your online friends to hear you spin, too. On your phone or tablet, edjing from DJiT offers a straightforward interface with smooth-running features and an in-app store for buying audio effects, which you might or might not need. We also appreciate the nice automix feature, because, as mentioned, nobody wants to stand behind a table for the entire night. We chose edjing in part for its simplicity. If you’re looking for something a little more advanced, try meta.DJ (iOS), which offers drum and synth pads for playing along with the songs, and a cue function for pre-determining where tracks start playing. For Android, we like DJ Studio 5 as a alternative to Edjing. To use just about any DJ app or software, you need to grasp the following, at the very least. The Decks: Each deck mimics the turntable where DJs of the (mostly) past used to place vinyl records. This is where you drag a song you want to play. You have two decks — one for each song, the one that is playing, and the one that is about to play. Try dragging a song to either deck and pushing the Play button. In Virtual DJ, this means going to the menu in the lower-left, selecting your iTunes library, Music folder, or any other place where you store your music files, and simply dragging one onto deck. To queue up a track in edjing, select the music note logo next to the deck you want to use, then choose a song from music library viewer. You can “scratch” the files as they play on the decks, but this tends to be more of a gimmick, because a mouse or fingertip on a smartphone doesn’t offer the same level of control as spinning actual vinyl. Still, it can be fun. Cues and the Sync Button: Now that you’ve played a song on the deck, it’s time to learn how to mix in another track. Ideally, in a party environment, you’d have some sort of reason for choosing to play the second song after the first song (sonic or otherwise), but if not, no big deal. Drag this second song to the other deck. This is where Cue Points might come in, if you want to deal with those before the party. These tell the software where to start playing the second song. (For example, you might want to avoid a lengthy intro.) To do this, it’s best to use the waveform visualizer, so you can see where a song’s boring or quiet intro ends, and put the Cue Point right after that. The waveform visualizer can be found at the top of the screen in both Virtual DJ and edjing. 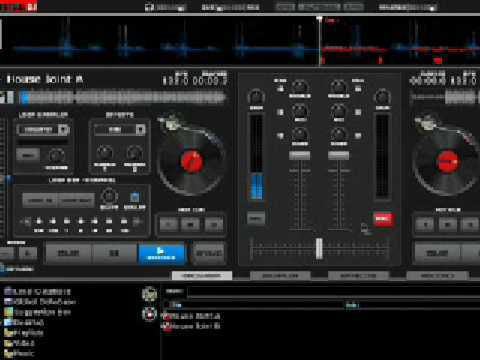 You can set cues in Virtual DJ by pressing the numbered buttons on either deck at the moment you want to set the cue. Edjing has a cue function available for purchase in their in-app store. Before you press Play on the second track, click the Sync button to set up the songs to fade together relatively seamlessly, then click the Play button on the second deck. If things sound a little off, press Sync again. Crossfader: The crossfader determines the volume ratio between two tracks playing on the decks. Put simply: This represents how much of one song you can hear versus the other, as you transition from one track to the next. Slide the crossfader towards the deck you want to hear more from. If you don’t want to hear part of a song, simply pivot all the way towards the opposite deck. Looping: Sometimes, you might want one section of a song to repeat, while another song plays over that. This technique is called looping. You can loop a a beat, a sixteenth note, or even one or more measures of a song. The diagrams below illustrate where the looping tool is located in Virtual DJ and in edjing (in the latter, it’s in the FX menu). You might be content just playing with the crossfader for smooth transitions between tracks, because that’s more than enough to keep a party flowing if you pick great music. However, to take things to the next level, you might try spinning two songs at the same time, and playing around with effects. If you choose the latter, be aware that a thorough knowledge of the tracks you’re playing will give you a lot more artistic control over your mixes. Being well acquainted with the different parts of your songs (e.g. what drops where) allows you to work more effectively with effects and looping. You might also want to look into software to organize your song library by key and time signature. Once you’ve done that, you can organize playlists of songs in the same key, or with similar time signatures, then you can access them directly in Virtual DJ. That way, you won’t have to rely as much on the Sync button to make the notes match up. Besides, playing songs in the same key or with similar time signatures helps your mixes sound more natural. The stuff discussed in this section does not typically come for free. Of the pay-only options for sorting your library by key and tempo, Mixed In Key seems to be the most popular. Only one free option appears to exist – Rapid Evolution 3 from MixShare — is currently in a beta version.